"Race war" redirects here. For the racing event in the The Fast and the Furious film, see Race Wars. 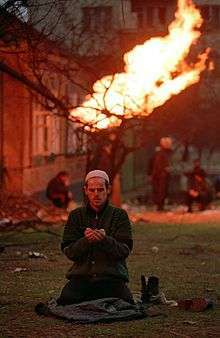 A Chechen man praying during the battle of Grozny in 1995 (photography by Mikhail Evstafiev). An ethnic conflict is a conflict between two or more contending ethnic groups. While the source of the conflict may be political, social, or economic, the individuals in conflict must expressly fight for their ethnic group's position within society. This final criterion differentiates ethnic conflict from other forms of struggle. Ethnic conflict does not necessarily have to be violent. In a multi-ethnic society where freedom of speech is protected, ethnic conflict can be an everyday feature of plural democracies. For example, ethnic conflict might be a non-violent struggle for resources divided among ethnic groups. However, the subject of the confrontation must be either directly or symbolically linked with an ethnic group. In healthy multi-ethnic democracies, these conflicts are usually institutionalized and "channeled through parliaments, assemblies and bureaucracies or through non-violent demonstrations and strikes." While democratic countries cannot always prevent ethnic conflict flaring up into violence, institutionalized ethnic conflict does ensure that ethnic groups can articulate their demands in a peaceful manner, which reduces the likelihood of violence. On the other hand, in authoritarian systems, ethnic minorities are often unable to express their grievances. Grievances are instead allowed to fester which might lead to long phases of ethnic silence followed by a violent outburst. Therefore, ethnic peace is an absence of violence, not an absence of conflict. Another consequence is that violent ethnic rebellions often result in political rights for previously marginalized groups. The causes of ethnic conflict are debated by political scientists and sociologists. Explanations generally fall into one of three schools of thought: primordialist, instrumentalist, and constructivist. More recent scholarship draws on all three schools. Proponents of primordialist accounts argues that "[e]thnic groups and nationalities exist because there are traditions of belief and action towards primordial objects such as biological features and especially territorial location". Primordialist accounts rely on strong ties of kinship among members of ethnic groups. Donald L. Horowitz argues that this kinship "makes it possible for ethnic groups to think in terms of family resemblances". Clifford Geertz, a founding scholar of primordialism, asserts that each person has a natural connection to perceived kinsmen. In time and through repeated conflict, essential ties to one's ethnicity will coalesce and will interfere with ties to civil society. Ethnic groups will consequently always threaten the survival of civil governments but not the existence of nations formed by one ethnic group. Thus, ethnic conflict in multi-ethnic society is inevitable through a primordial lens. There are a number of political scientists who argue that the root causes of ethnic conflict do not involve ethnicity per se but rather institutional, political, and economic factors. These scholars argue that the concept of ethnic war is misleading because it leads to an essentialist conclusion that certain groups are doomed to fight each other when in fact the wars between them occur are often the result of political decisions. Moreover, primordial accounts do not account for the spatial and temporal variations in ethnic violence. If these "ancient hatreds" are always simmering under the surface and are at the forefront of people's consciousness, then we should see ethnic groups constantly ensnared in violence. However, ethnic violence occurs in sporadic outbursts. For example, Varshney points out that although Yugoslaiva broke up due to ethnic violence in the 1990s, it did experience a long peace before the USSR collapsed. Therefore, some scholars claim that it is unlikely that primordial ethnic differences alone caused the outbreak of violence in the 1990s. However, primordialists have reformulated the "ancient hatreds" hypothesis and have focused more on the role of human nature. Peterson argues that the existence of hatred and animosity does not have to be rooted in history for it to play a role in shaping human behavior and action: "If "ancient hatred" means a hatred consuming the daily thoughts of great masses of people, then the "ancient hatreds" argument deserves to be readily dismissed. However, if hatred is conceived as a historically formed "schema" that guides action in some situations, then the conception should be taken more seriously." However, it is difficult to measure the importance of emotions in leading to outbreaks of ethnic violence and identify the factors that influence the intensity of hatred that ethnic groups harbor towards each other over time. Furthermore, ethnic mass mobilization is likely to be plagued by collective action problems, especially if ethnic protests are likely to lead to violence. Instrumentalist scholars have tried to respond to these shortcomings. For example, Hardin argues that ethnic mobilization faces problems of coordination and not collective action. He points out that a charismatic leader acts as a focal point around which members of an ethnic group coalesce. The existence of such an actor helps to clarify beliefs about the behavior of others within an ethnic group. The post–Cold War period has witnessed a number of ethnically-informed secessionist movements, predominantly within the former communist states. Conflicts have involved secessionist movements in the former Yugoslavia, Transnistria in Moldova, Armenians in Azerbaijan, Abkhaz and Ossetians in Georgia. Outside the former communist bloc, ethno-separatist strife in the same period has occurred in areas such as Sri Lanka, West Papua, Chiapas, East Timor, the Basque Country Southern Sudan and Hazaras in Afghanistan under the Taliban. A major source of ethnic conflict in multi-ethnic democracies is over the access to state patronage. Conflicts over state resources between ethnic groups can increase the likelihood of ethnic violence. In ethnically divided societies, demand for public good decreases as each ethnic group derives more utility from benefits targeted at their ethnic group in particular. These benefits would be less valued if all other ethnic groups had access to them.Targeted benefits are more appealing because ethnic groups can solidify or heighten their social and economic status relative to other ethnic groups whereas broad programmatic policies will not improve their relative worth. Politicians and political parties in turn, have an incentive to favor co-ethnics in their distribution of material benefits. Over the long run, ethnic conflict over access of sate benefits is likely to lead to the ethnification of political parties and the party system as a whole where the political salience of ethnic identity increase leading to a self-fulfilling equilibrium: If politicians only distribute benefits on an ethnic basis, voters will see themselves primarily belonging to an ethnic group and view politicians the same way. They will only vote for the politician belonging to the same ethnic group. In turn, politicians will refrain from providing public goods because it will not serve them well electorally to provide services to people not belonging to their ethnic group. In democratizing societies, this could lead to ethnic outbidding and lead to extreme politicians pushing out moderate co-ethnics. Patronage politics and ethnic politics eventually reinforce each other, leading to what Chandra terms a "patronage democracy." The existence of patronage networks between local politicians and ethnic groups make it easier for politicians to mobilize ethnic groups and instigate ethnic violence foe electoral gain since the neighborhood or city is already polarized along ethnic lines. The dependence of ethnic groups on their co-ethnic local politician for access to state resources is likely to make them more responsive to calls of violence against other ethnic groups. Therefore, the existence of these local patronage channels generates incentives for ethnic groups to engage in politically motivated violence. While the link between ethnic heterogeneity and under provision of public goods is generally accepted, there is little consensus around the causal mechanism underlying this relationship. To identify possible causal stories, Humphreys and Habyarimana ran a serious of behavioral games in Kampala, Uganda that involved several local participants completing joint tasks and allocating money amongst them. Contrary to the conventional wisdom, they find that participants did not favor the welfare of their co-ethnics disproportionately. It was only when anonymity was removed and everyone’s ethnicity was known did co-ethnics decide to favor each other. Humphreys and Habyarimana argue that cooperation among co-ethnics is primarily driven by reciprocity norms that tend to be stronger among co-ethnics. The possibility of social sanctions compelled those who would not otherwise cooperate with their co-ethnics to do so. The authors find no evidence to suggest that co-ethnics display a greater degree of altruism towards each other or have the same preferences. Ethnic cooperation takes place because co-ethnics have common social networks and therefore can monitor each other and can threaten to socially sanction any transgressors. A number of scholars have attempted to synthesize the methods available for the resolution, management or transformation their ethnic conflict. John Coakley, for example, has developed a typology of the methods of conflict resolution that have been employed by states, which he lists as: indigenization, accommodation, assimilation, acculturation, population transfer, boundary alteration, genocide and ethnic suicide. John McGarry and Brendan O'Leary have developed a taxonomy of eight macro-political ethnic conflict regulation methods, which they note are often employed by states in combination with each other. They include a number of methods that they note are clearly morally unacceptable. The inherent weaknesses in using pre-determined ethnic identities to form power sharing systems has led Ljiphart to argue that adopting a constructivist approach to consociationalism can increase its likelihood of success. The self-determination of ethnic identities is more likely to be "non-discriminatory, neutral, flexible and self-adjusting." For example, in South Africa, the toxic legacy of apartheid meant that successful consociation could only be built on the basis of the self-determination of groups. Ljiphart claims that because ethnic identities are often "unclear, fluid and flexible," self-determination is likely to be more successful than pre-determination of ethnic groups. A constructivist approach to consociational theory can therefore strengthen its value as a method to resolve ethnic conflict. The theory of implementing federalism in order to curtail ethnic conflict assumes that self-governance reduces "demands for sovereignty". Hechter argues that some goods such as language of education and bureaucracy must be provided as local goods, instead of statewide, in order to satisfy more people and ethnic groups. Some political scientists such as Stroschein contend that ethno-federalism, or federalism determined along ethnic lines, is "asymmetric" as opposed to the equal devolution of power found in non-ethnic federal states, such as the United States. In this sense, special privileges are granted to specific minority groups as concessions and incentives to end violence or mute conflict. The origin of NTA can bee traded back to the Marxists works of Otto Bauer and Karl Renner. NTA was employed during the interwar period, and the League of Nations sought to add protection clauses for national minorities in new states. In the 1920s, Estonia granted some cultural autonomy to the German and Jewish populations in order to ease conflicts between the groups and the newly independent state. However, in cities, where the population tends to be much higher, informal interactions between ethnic groups might not be sufficient to prevent violence. This is because you need many more links to connect everyone and therefore it is much more difficult to form and strengthen inter-ethnic ties. In cities, formal inter-ethnic associations like trade unions, business associations and professional organizations are more effective in encouraging inter-ethnic interactions that could prevent ethnic violence in the future. These organizations force ethnic groups to come together based on shared economic interests that overcomes any pre-existing ethnic differences. For example, inter-ethnic business organizations serve to connect the business interests of different ethnic groups which would increase their desire to maintain ethnic harmony. Any ethnic tension or outbreak of violence will go against their economic interests and therefore, over time, the salience of ethnic identity diminishes. ↑ Varshney, Ashutosh (2002). Ethnic Conflict and Civic Life : Hindus and Muslims in India. New Haven: Yale University Press. ↑ Kaufman, Stuart J. (2001). Modern Hatreds: The Symbolic politics of ethnic war. Ithaca: Cornell University Press. p. 17. ↑ Olzak, Susan (1992). Dynamics of Ethnic Competition and Conflict. Stanford: Stanford University Press. 1 2 Varshney, Ashutosh (2007). "Ethnicity and Ethnic Conflict" (PDF). Oxford handbook of comparative politics. ↑ Koos, Carlo (2016-02-01). "Does violence pay? The effect of ethnic rebellion on overcoming political deprivation". Conflict Management and Peace Science. 33 (1): 3–24. doi:10.1177/0738894214559670. ISSN 0738-8942. ↑ Grosby, Steven (1994). "The verdict of history: The inexpungeable tie of primordiality – a response to Eller and Coughlan". Ethnic and Racial Studies. 17 (1): 164–171 [p. 168]. doi:10.1080/01419870.1994.9993817. ↑ Horowitz, Donald L. (1985). Ethnic Groups in Conflict. Berkeley, CA: University of California Press. p. 57. ISBN 0520053850. ↑ Geertz, Clifford (1963). Old societies and new States; the quest for modernity in Asia and Africa. London: Free Press of Glencoe. 1 2 3 4 5 6 7 Lijphart, Arend (Winter 2001). "Constructivism and Consociational Theory" (PDF). Newsletter of the Organized Section in Comparative Politics of the American Political Science Association. 1 2 Giuliano, Elise (2011). Constructing Grievance: Ethnic Nationalism in Russia's Republics. Cornell University Press. ↑ Varshney, Ashutosh (2007). "Ethnicity and Ethnic Conflict" (PDF). Oxford handbook of comparative politics. 1 2 Smith, Anthony (2001). "Nationalism: Theory, Ideology, History". Cambridge: Polity: 54–55. ISBN 0745626580. ↑ Cornell, Stephen; Hartmann, Douglas (1998). Ethnicity and Race: Making Identities in a Changing World. Thousand Oaks, CA: Pine Forge. p. 59. ISBN 0761985018. ↑ Schlichting, Ursel (1997). "Conflict Between Different Nationalities: Chances for and Limits to Their Settlement". In Klinke, Andreas; Renn, Ortwin; Lehners, Jean Paul. Ethnic Conflicts and Civil Society. Aldershot: Ashgate. ISBN 1840144556. ↑ Smith, Dan (2003). "Trends and Causes of Armed Conflicts". In Austin, Alexander; Fischer, Martina; Ropers, Norbert. Berghof Handbook for Conflict Transformation (PDF). Berlin: Berghof Research Centre for Constructive Conflict Management/Berghof Foundation. 1 2 Snyder, Jack (2000). From Voting to Violence: Democratization and Nationalist Conflict. W. W. Norton & Company. 1 2 3 4 5 6 Brubaker, Roger (1996). Nationalism Reframed. New York: Cambridge. ↑ Kymlicka, Wil (2001). Can Liberalism Be Exported?. Oxford University Press. ↑ Evangelista, Matthew (2005). "Peace studies: Critical concepts in political science.". Taylor & Francis. ↑ Mamdani, Mahmood (2001). 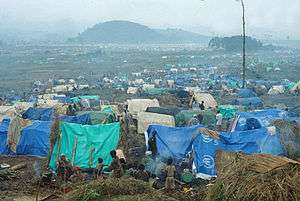 When Victims Become Killers: Colonialism, Nativism, and the Genocide in Rwanda. Princeton, NJ: Princeton University Press. ISBN 0691058210. ↑ Varshney, Ashutosh (2007). "Ethnicity and Ethnic Conflict" (PDF). Oxford handbook of comparative politic. 1 2 Toft, Monica Duffy (2003). The Geography of Ethnic Violence: Identity, Interests, and the Indivisibility of Territory. Princeton, NJ: Princeton University Press. ISBN 0691113548. ↑ Huntington, Samuel P. (1993). "The clash of civilizations?". Foreign Affairs. 72 (3): 22–49. doi:10.2307/20045621. ↑ Kaplan, Robert D. (1994). "The coming anarchy". The Atlantic Monthly. 273 (2): 44–76. ↑ Wallensteen, Peter; Sollenberg, Margareta (1995). "After the Cold War: Emerging patterns of armed conflict 1989–94". Journal of Peace Research. 32 (3): 345–360. doi:10.1177/0022343395032003007. ↑ Harbom, Lotta; Wallensteen, Peter (2005). "Armed conflict and its international dimensions, 1946–2004" (PDF). Journal of Peace Research. 42 (5): 623–635. doi:10.1177/0022343305056238. ↑ "Measuring systemic peace". Center for Systemic Peace. 30 October 2006. Retrieved 18 February 2007. ↑ Gilley, Bruce (2004). "Against the concept of ethnic conflict". Third World Quarterly. 25 (6): 1155–1166. doi:10.1080/0143659042000256959. ↑ Fox, Jonathan (2002). "Ethnic minorities and the Clash of Civilizations: A quantitative analysis of Huntington's thesis". British Journal of Political Science. 32 (3): 415–434. doi:10.1017/S0007123402000170. ↑ Chiozza, Giacomo (2002). "Is there a Clash of Civilizations? Evidence from patterns of international conflict involvement, 1946–97". Journal of Peace Research. 39 (6): 711–734. doi:10.1177/0022343302039006004. JSTOR 1555255. 1 2 Kalyvas, Stathis N. (2006). The Logic of Violence in Civil War. New York: Cambridge University Press. ISBN 0521854091. ↑ Kolev, Wang (2010). "Ethnic Group Divisions and Clientelism". APSA Annual Meeting Paper. ↑ Kitschelt, Herbert (2007). Patrons, clients, and policies: Patterns of democratic accountability and political competition (PDF). Cambridge University Press. 1 2 BERENSCHOT, WARD (2010). "The Spatial Distribution of Riots: Patronage and the Instigation of Communal Violence in Gujarat, India" (PDF). World Development. 1 2 3 Habyaimana, James (November 2007). "Why does ethnic diversity undermine public goods provision?" (PDF). APSR. 1 2 3 4 5 Hechter, Michael (2000). Containing Nationalism. New York: Oxford University Press. 1 2 3 Stroschein, Sherrill (November 2014). "Consociational Settlements and Reconstruction: Bosnia in Comparative Perspective (1995- Present)". Annals of the American Academy. ↑ Kaufman, Stuart (Fall 1996). "Spiraling to Ethnic War: Elites, Masses, and Moscow in Moldova's Civil War". International Security. 1 2 3 Howard, Lisa Morje (October 2012). "The Ethnocracy Trap". Journal of Democracy. 1 2 3 Bieber, Florian (2001). "Challenge of Democracy in Divided Societies: Lessons from Bosnia-- Challenges for Kosovo". Reconstructing Multiethnic Societies: The Case of Bosnia-Hercegovina. Ashgate Press. pp. 109–121. ↑ Guss, Jason; Siroky, David S. (2012). "Living with Heterogeneity: Bridging the Ethnic Divide in Bosnia". Comparative Sociology. 1 2 Stroschein, Sherill (December 2008). "Making or Breaking Kosovo: Applications of Dispersed State Control". Perspectives on Politics. 1 2 Horowitz, Donald (1992). A Democratic South Africa? Constitutional Engineering in a Divided Society. University of California Press. pp. 167–173. ↑ Suny, Ronald (1993). The Revenge of the Past Nationalism, Revolution, and the Collapse of the Soviet Union. Stanford University Press. ↑ Bunce, Valerie (1998). "Subversive Institutions: The End of Soviet State in Comparative Perspective". Post-Soviet Affairs. ↑ Derluguian, Georgi M. (1999). "Ethnofederalism and Ethnonationalism: The Separatist politics of Chechnya and Tatarstan: Sources or Resources?". International Journal of Public Administration. ↑ Buchanan, Allen (1995). "Morality of Secession". In Kymlicka, Will. Rights of Minority Cultures. Oxford University Press. ↑ Gagnon, V.P. (2004). The Myth of Ethnic War: Serbia and Croatia in the 1990s. Cornell University Press. 1 2 3 Osipov, Alexander (2013). "Non-Territorial Autonomy during and after Communism: In the Wrong or Right Place?". Journal on Ethnopolitics and Minority Issues in Europe. 1 2 3 4 Coakley, John (1994). "Approaches to the Resolution of Ethnic Conflict: The Strategy of Non-territorial Autonomy". International Political Science Review. 1 2 3 4 Wolff, Stefan. "A Consociational Theory of Conflict Management" (PDF). 1 2 Smith, David J. "Challenges of Non-Territorial Autonomy in Contemporary Central and Eastern Europe". Challenge of Non-Territorial Autonomy: Theory and Practice. Peter Lang. ↑ Dalle Mulle, Emmanuel (2016). "Belgium and the Brussels Question: The Role of Non-Territorial Autonomy". Ethnopolitics. 1 2 Clarke, Charles. "Preface: Using the Ideas of 'Non-Territorial Autonomy' to Avoid Violent Conflict and Meet the Modern Challenges of Nationalism". The Challenge of Non-Territorial Autonomy. Peter Lang. ↑ Sen, Amartya (2007). Identity and Violence: The Illusion of Destiny. Penguin. ↑ Meyjes, Gregory Paul P. (2007) 'Plan "C" is for Culture: out of Iraq – Opportunity,' Landpower Essay 07-4, May 2007, Arlington, VA: Association of the United States Army. 1 2 3 4 5 6 Varshney, Ashutosh (April 2001). "Ethnic Conflict and Civil Society: India and Beyond" (PDF). World Politics. 1 2 Pickering, Paula (January 2006). "Generating social capital for bridging ethnic divisions in the Balkans: Case studies of two Bosniak cities" (PDF). Ethnic and Racial Studies.